Steve has been a long time friend and colleague of many at The River so we were very excited when he officially joined our staff team in April 2018 as our Executive Pastor. As Executive Pastor, Steve’s hope is to maximize our effectiveness in ministry both within the church as well as out into the broader world by leading and collaborating with our staff and lay leaders to embody the vision and values of Jesus. His areas of focus are managing the staff, adult spiritual formation, teaching, and church strategy. Prior to coming to The River, Steve served for 16 years in a wide variety of pastoral roles at the Palo Alto and Mt. View campuses of the Highway Community Church. 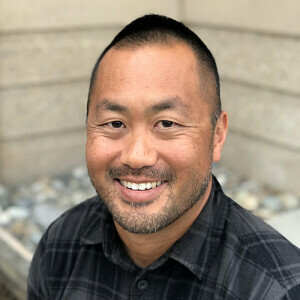 He also has experience in urban ministry with Bayshore Christian Ministries in East Palo Alto and campus ministry with Intervarsity Christian Fellowship at Brown University. When asked why he is passionate about church ministry, Steve said, “When the church faithfully embodies the upside-down kingdom of Jesus as a welcoming and prophetic community, goodness, justice, beauty and life flourish for everyone. I am passionate about helping lead the church to live more fully into this calling in all spheres of life, especially in the sometimes difficult areas such as social justice, work-faith, and reconciliation. I also just love people, and love seeing people grow into living vibrantly and being part of the family of God through church community. The center of Steve’s life and ministry is his family which includies his wife Amy (who is a seasoned urban minister) and two daughters, Bethany and Kyra. He grew up a swimmer and water polo player, but is more or less obsessed with enjoying and playing the Beautiful Game (Soccer) every way possible. He has been a lifelong musician and lover of music, and deeply enjoys making (and consuming) foods and drinks that involve yeast.